A square coil is placed on top of a dielectric window and is electrically excited, while a plasma is formed in an argon-filled chamber beneath. The plasma is sustained via electromagnetic induction where power is transferred from the electromagnetic fields to the electrons. ICP reactors typically operate at pressures in the millitorr range and produce much higher electron densities than capacitively coupled plasmas. Inductively coupled plasmas are popular because ion bombardment at low pressures results in a uniform etch rate on the surface of the wafer. The surface plot shows the electron number density inside a GEC ICP reactor. DIELECTRIC CURRENT DISCHARGES: A small gap is filled with a gas between two dielectric plates. Voltage is applied so that any free electrons will be accelerated and cause ionization. Shown is the mass fraction of electronically excited Argon atoms. MICROWAVE PLASMAS: In this cross-flow configuration, a TE mode wave enters from the top boundary and is absorbed when it interacts with the plasma. The white contour shows the location where the electron density is equal to the critical electron density. The wave is completely absorbed by the plasma. Inductively coupled plasmas (ICP) were first used in the 1960s as thermal plasmas in coating equipment. These devices operated at pressures on the order of 0.1 atm and produced gas temperatures on the order of 10,000 K. In the 1990s, ICP became popular in the film processing industry as a way of fabricating large semiconductor wafers. These plasmas operated in the low-pressure regime, from 0.002-1 torr, and as a consequence, the gas temperature remains close to room temperature. Low-pressure ICPs are attractive because they provide a relatively uniform plasma density over a large volume. The plasma density is also high, around 1018 1/m3, which results in a significant ion flux to the surface of the wafer. Faraday shields are often added to reduce the effect of capacitive coupling between the plasma and the driving coil. 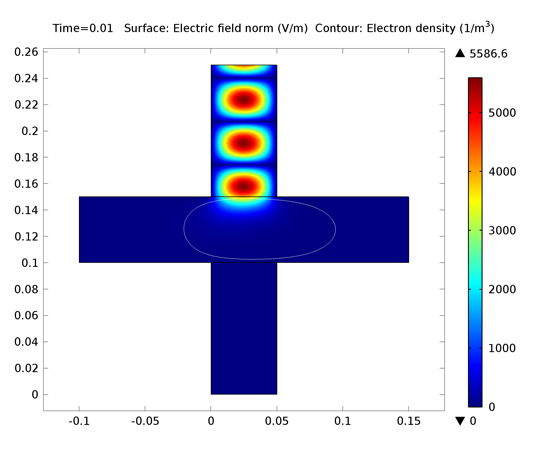 The Inductively Coupled Plasma interface automatically sets up the complicated coupling between the electrons and the high frequency electromagnetic fields that are present in this type of plasma. The Inductively Coupled Plasma interface requires both the Plasma Module and the AC/DC Module. To facilitate your modeling of plasma processes, a new Global diffusion model now enables you to perform initial analyses of your processes, before optimizing them with more accurate modeling. Global modeling reduces the degrees of freedom for your models through applying ordinary differential equations to your plasma model. This allows complex reaction chemistries to be tested and verified before running space-dependent models, while the reactor geometry, surface chemistry, and feed streams are all still taken into account. 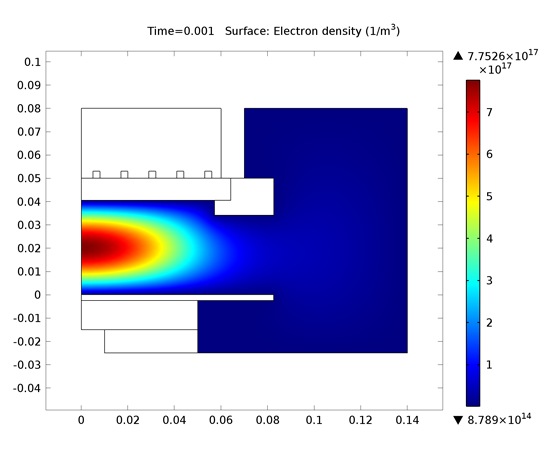 A specialized physics interface is available for modeling direct current (DC) discharges, which are sustained through secondary electron emission at the cathode due to ion bombardment. The interface allows for model inputs and contains the underlying equations and conditions for modeling this phenomenon. The electrons ejected from the cathode are accelerated through the cathode fall region into the bulk of the plasma. They may acquire enough energy to ionize the background gas, creating a new electron-ion pair. The electron makes its way to the anode, whereas the ion will migrate to the cathode where it may create a new secondary electron. It is not possible to sustain a DC discharge without including secondary electron emission. 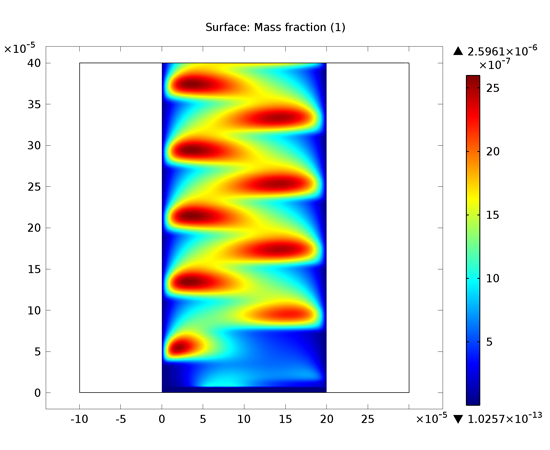 You can use the Microwave Plasma interface to model wave heated discharges, which are sustained when electrons can gain enough energy from an electromagnetic wave as it penetrates the plasma. The physics of a microwave plasma are quite different depending on whether the TE mode (out-of-plane electric field) or the TM mode (in-plane electric field) is propagating. In neither case is it possible for the electromagnetic wave to penetrate into regions of the plasma where the electron density exceeds the critical electron density (around 7.6x1016 1/m3 for argon at 2.45 GHz). The pressure range for microwave plasmas is very broad. For electron cyclotron resonance (ECR) plasmas, the pressure can be on the order of 1 Pa or less. For non-ECR plasmas, the pressure typically ranges from 100 Pa up to atmospheric pressure. The power can range from a few watts all the way up to several kilowatts. Microwave plasmas are popular thanks to the cheap availability of microwave power. The Microwave Plasma interface requires both the Plasma Module and the RF Module.